Baby Rhino Marcules at Baby Rhino Rescue | Adopt and Donate Now! 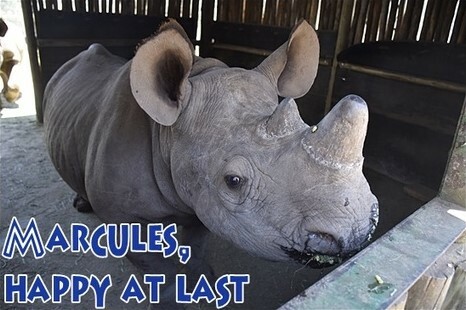 Marcules is a black rhino. This makes him important as black rhinos are critically endangered. He was abandoned by his mother in the Kruger Park, so was taken to the Kruger rhino bomas. He did not get along with the other rhinos and became very unhappy there. It was decided to move him to Care for Wild Africa because Odin, another black rhino, lives there. Marcules arrived at the sanctuary in January 2016. The hope was that he and Odin would bond and become friends, providing important company for Odin and a happy environment for Marcules. Marcules is a little younger than Odin and the older rhino took to him immediately! It was a beautiful thing to see, especially because Odin had been alone and depressed. The two black rhinos are very close. They do everything together: they walk together, eat together, take mud baths and lie together. They are both treated to “rhino lollys” a special thing for a rhino, super great-tasting with lots of glucose. A big piece of virgin bush is being prepared for them and they will be released into this as soon as it is ready. This will take their lives to a new level of completeness. Until that happens though, Marcules has a very good friend, he is happy and he is safe.